Learn more about the Common Core State Standards at www.corestandards.org. CAFE & Daily 5 are used in Sauganash School in grades Kindergarten through 5th Grade. CAFE represents comprehension, accuracy, fluency, and expand vocabulary. CAFE Mini-Lessons - Mini-lessons teach strategies and skills to build success in literacy. Learn more about Daily 5 and CAFE by purchasing their books or going to www.thedailycafe.com. Kindergarten students begin to learn how to read through phonemic awareness, letter recognition, phonics, and high frequency words. When students understand and master these skills, they are usually able to read fluently and comprehend the text, which is the purpose of reading. Phonemic awareness focuses on the individual sounds of words and the understanding that these sounds make words. Each sound is a phoneme. Example: apple phonemes: "a", "puh", "l"
Letter recognition focuses on identifying written letters of the alphabet. Phonics fuses sounds and letters. In phonics, students correlate letters and sounds. Example: The letter p makes the sound "puh". High frequency words are the most frequent words used in children's literature. E.W. Dolch and Edward Fry created lists that identify the most frequently used words. *Find out more about how children learn to read and how to support students at home at www.k12reader.com, www.nifl.gov, and www.national-readingpanel.org. 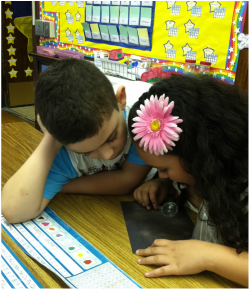 Close Reads - During Close Reads, students read texts and pictures closely as well as repetitiously like an investigator, finding evidence in the text to support conclusions and to aid with comprehension. Students also actively mark the text with symbols to indentify interesting, surprising, new, and funny information. Furthermore, students identify new vocabulary words and text connections, such as text to text, text to self, and text to world. Interactive Read-Aloud - During Interactive Read-Alouds, teachers/parents/volunteers/students read aloud to the class and ask critical thinking questions. Mystery Reader - A Mystery Reader is a family member, friend or community member who reads to the class. Students guess who the mystery reader is behind the classroom door. Schedule an appointment with Mrs. Yadao to be a Mystery Reader. Once Mrs. Yadao has a list of family emails, she will be able to create the sign-up on Sign-up Genius, an online sign up website. Guided Reading - Guided Reading is when a teacher reads with a small group of students at their ability level to work on reading skills and strategies with the guidance of the teacher. Graphic Organizers - T-charts, Venn diagrams, Lists, Wheels, Pre-Writing Hamburger (1st Grade Paragraph Writing), Sequencing Charts, etc. Spelling - Spelling is covered during Word Work in Daily 5. Spelling is also covered during word family, vocabulary, and writing instruction. In kindergarten, spelling practice tests will begin toward the end of 2nd quarter or 3rd quarter. First Grade Assessments - Kindergarten families, think about what is to come. 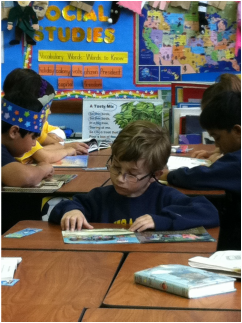 There will be a reading and spelling test almost every Friday in first grade. In first grade, there will be assessments in all subjects. Students will read reading assessments on their own. Get ready! During quarter 1 and 2, students will read reading tests on their own. All other tests in other subjects will be read to them. Students will take oral reading, multiple choice, and written tests. Students must restate the question in their written answers. Students will practice this in class. During Quarter 3 and 4, students will read all tests on their own to prepare for 2nd grade, which gives light to the importance of reading each night and building literacy skills. Book Bins – Book bins include books at each child's reading level as well as a schoolwork folder. Reading Folder - Reading Folders are sent home. The folder includes one or more books at each student's reading level, comprehension questions, and a parent comment form, which provides 2-way communication between the parent and the teacher. Short books should be read several times before returning the folder to the teacher. The books should be brought back to school every week or two. Classroom Library – One book goes home in plastic bag. This book caters to students interests. 3 or more fiction and non-fiction books will go in students' book bins for silent reading, the read to self daily, and reading stamina. Sauganash School uses the Lucy Calkins Writing Method as well as the Zaner Blozer Handwriting Method. - writing 1,2 or 3 complete and detailed sentences, using a capital letter at the beginning of the sentence and incorportating proper punctuation at the end of the sentence. Writing mini-lessons will introduce, teach, and model writing skills as well as strategies. Students will think about the purpose of their writing/drawing as well as the audience. *** Students who are ready may begin writing paragraphs. First grade will focus on writing a detailed paragraph. We will write narratives, persuasive essays, letters, poems, autobiographies, lists, and stories. —Writing paper, grammar editing marks, the writing rubric, and an example of a friendly letter can be found and printed from the "Resources" page on this website. —Writing Paper – Please copy and use the first grade paper provided for homework and practice. RAZkids.com - Students read books online at their reading level, record their voice, listen to their voices, and take quizzes. Students will be challenged to create number charts to 1,000. Students will be taking timed, single-digit math fact tests 3rd and 4th Quarter. Students will be given 4 seconds to answer 32 questions, which is 2 minutes and 13 seconds. Students will also be taking a test on each topic of study listed above. Quarter 2, 3, 4: Important People - MLK, Rosa Parks, Ruby Bridges, Presidents, etc. If you are available to discuss your career with the class, please contact Mrs. Yadao. Next Generation Science Standards (NGSS) are content standards that set the expectations for what students should know and be able to do for college and career readiness. The Next Generation Science Examplar (NGSX) is a student-centered and problem-based method of instruction. Students are given a phenomena, and students lead the lesson with support and guidance from their teacher. The Next Generation Science Standards (NGSS) are K–12 science content standards. Standards set the expectations for what students should know and be able to do. The NGSS were developed by states to improve science education for all students. A goal for developing the NGSS was to create a set of research-based, up-to-date K–12 science standards. These standards give local educators the flexibility to design classroom learning experiences that stimulate students’ interests in science and prepares them for college, careers, and citizenship. How will students learn science in the classroom? Each year, students should be able to demonstrate greater capacity for connecting knowledge across, and between, the physical sciences, life sciences, earth and space sciences, and engineering design. planning and carrying out investigations, and constructing explanations.